NEW Family Membership and Class & Club Registration is Open Now! Take Advantage of our Early Bird Special through April 30th! Please follow the link HERE and fill in the Membership Form. Once your New Website Registration / MHS Explorers Membership Fee of $25 is received we will approve your membership request and give you access to the MHS Website to sign up for field trips & events on our calendar. If you plan to register for classes & clubs on the class registration page it is an additional fee for the Annual Family Membership. Take advantage of our early bird special during the month of April of $100. On May 1st that increases to $125. 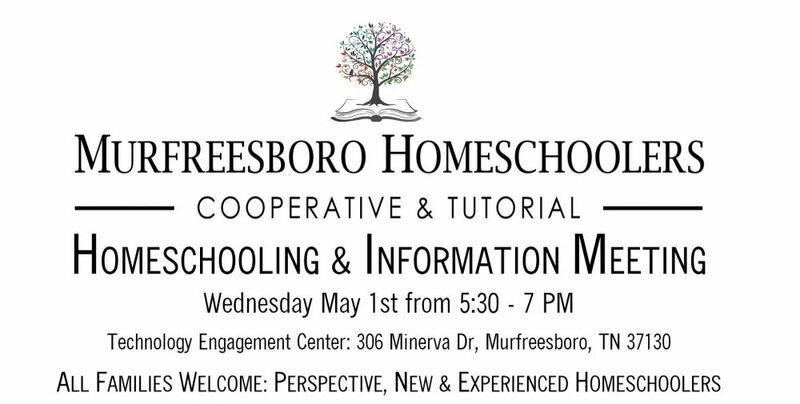 MHS Welcomes your family to our Homeschooling & Information Meeting on Wednesday May 1st from 5:30 - 7 PM at the Technology Engagement Center: 306 Minerva Dr, Murfreesboro, TN 37130. Come learn about homeschooling and how our educational organization Murfreesboro Homeschoolers can help with your homeschooling journey! At Murfreesboro Homeschoolers (MHS) we provide academic courses, educational clubs and activities for home schooled children in preschool through high school as well as support for homeschooling families in Middle Tennessee. 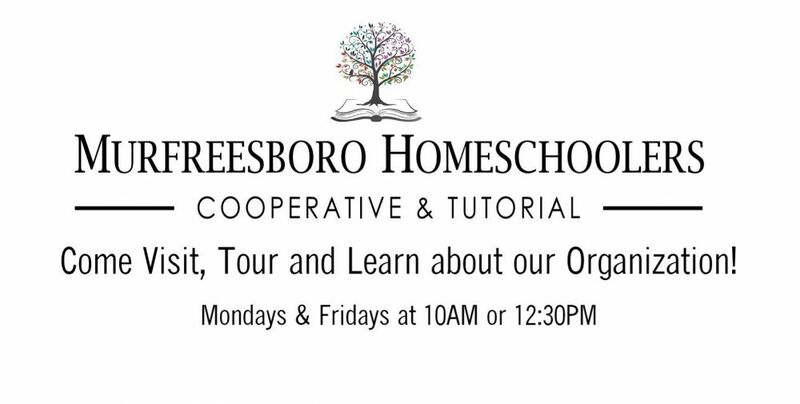 We welcome everyone to come visit, tour & learn about all the wonderful things Murfreesboro Homeschoolers is offering in the 2019-2020 academic year! If you are interested in joining our organization or considering homeschooling we would love to share with you how MHS can help your family’s homeschooling journey. Come meet members, tour our location and learn all about our MHS Explorers membership and hybrid cooperative & tutorial organization. If you decide MHS is right for your family, we will have members of leadership who can help walk you through the registration process and go over the welcome packet. We can't wait to share all the exciting opportunities we have for your children in PreK - 12th grade! Children are welcome and encouraged to attend this event! Sign up by clicking the link below for a time to visit during the months of April & May on Mondays or Fridays at 10AM or 12:30PM. Please visit our Handbook for more information about MHS and sign up for one of the events below to see if our organization is a wonderful fit for the needs of your family. MHS Explorers: Includes access to our field trips and off-site events. The perfect membership for families wanting a little adventure and to make connections with other local homeschooling families! MHS On-Site Family - Clubs Only: Includes access to our field trips & events and all parent-led clubs. This is a great option for parents who want to stay involved in teaching and be part of a homeschooling community! Parents must complete the background check requirement. Please note: Students may not attend clubs without parents*. MHS On-Site Family - Classes & Clubs: Includes access to our field trips & events, parent-led clubs, and tutorials for a full complement of educational and social opportunities for your family! Parents must complete the background check requirement. Please note: Students may not attend clubs without parents*. MHS On-Site & Drop-off Family: Parent can choose this option if they would like to have the ability to drop off their student(s) for classes or supervised lunch, but also be on-site for clubs or social time with other homeschool parents! In order to qualify for this option, the student must be at least 8 years old. Parents must complete the background check requirement. Please note: Students may not attend clubs without parents*. MHS Drop-off Only Family: Parents can choose this option if they would like to have the ability to drop off their student(s) for classes or supervised lunch and not be on-site. In order to qualify for this option, students must be at least 8 years old. Parents are not required to complete the background check requirement for this option. *Please note: ALL students participating in clubs will need their parents to be with them. The only exception to this is National Ocean Science Bowl Club. YES! In all 50 states of the USA, homeschooling is legal! Each state has their own laws, HERE is the state of TN homeschooling laws. This link explains the three types of homeschooling in Tennessee: Independent Home School, Church-Related Umbrella School & Accredited Online School. All you need is a High School Diploma or GED to legally home school your children in the state of Tennessee. This is where MHS can help on so many levels! Our tutorial classes and community organized clubs, field trips and events are the perfect solution for socialization, education and building relationships for homeschooling students and their families. At MHS we bridge the gap between homeschooling and public/private school by organizing events such as our Semester Showcases at the end of each semester where children in our music and theater classes perform and children in our other classes create projects to put on display for family and friends to enjoy.